Is it possible that pregnancy happens outside of uterus? Beginning of life happens with fertilization of ova with sperm in the Fallopian tube. 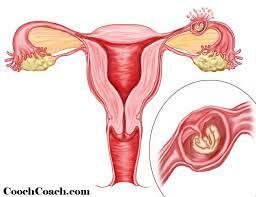 After sometime the embryo will come to the uterus, get implanted and will grow. As you can see on the right side of the picture- The path is shown for the normal pregnancy. On the left side of picture it is shown, that due to some reasons the fertilized ovum will not advance and will stay in the fallopian tube. This is an abnormal condition. 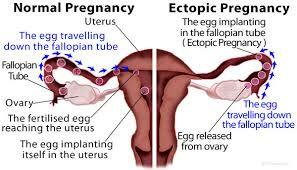 What are the complications of a an ectopic pregnancy and what are the treatment options available? To grow fully, normal pregnancy requires a muscular,spacious and strong organ like uterus. 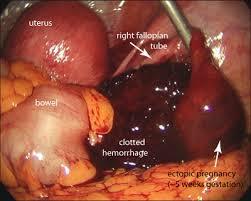 Fallopian tube is a delicate structure.When pregnancy starts to grow in it there are real dangers of it rupturing. As the diagram and laparosopic image show, this condition can be life threatening. The most common treatment option is surgery which can be conventional operation like laparotomy or modern age laparoscopy.